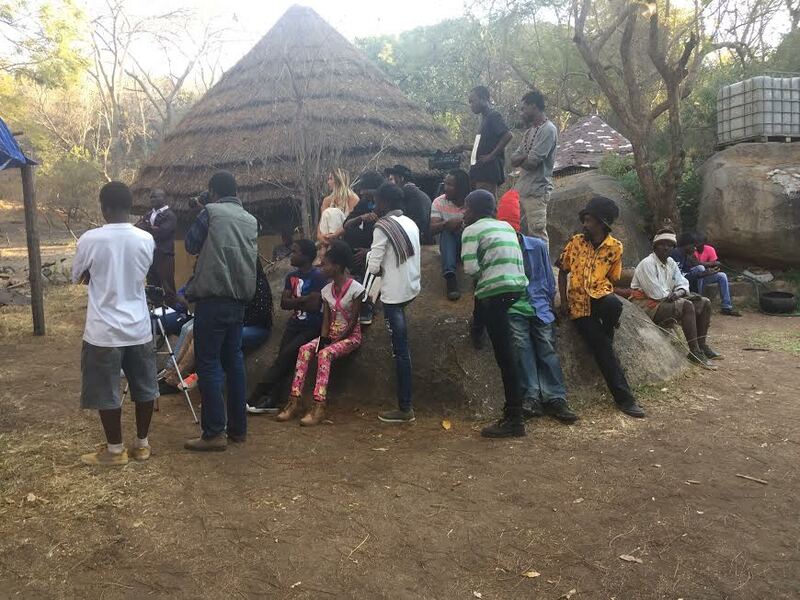 Deepening our roots in Zimbabwe, we returned for a second project with our local partners, Dzimbanhete Arts & Culture Interactions. 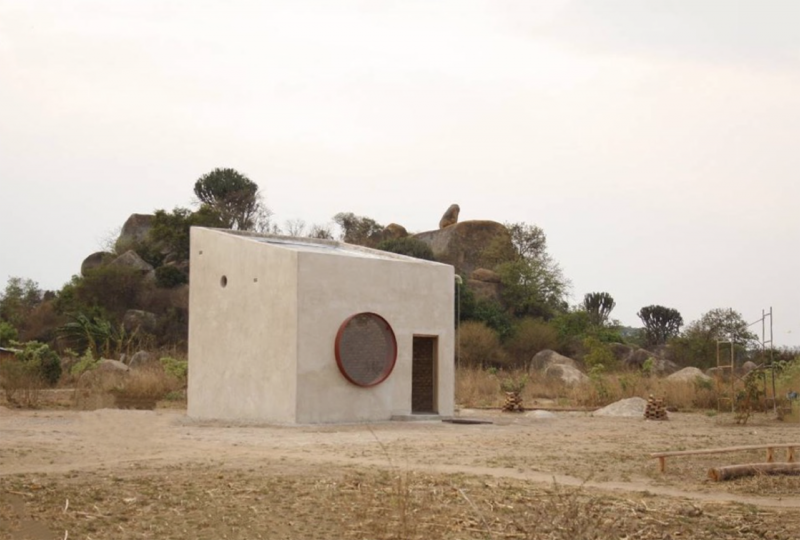 We built a structure, now known as CTG Harare, which will act as a satellite space to the NYC Gallery and run a 3-year program of exhibitions setting foreign artists in conversation with Zimbabwe-based artists. Located 20-minutes outside of the city center, it is surrounded by bushland and small villages. 1972 is a performance-based work recorded in photographs. The images present an inter-racial couple living in Harare in 1972. At the time, marriage between black and white was virtually impossible and there were political attempts to make it illegal. 1972 was also the beginning of a 7 year long guerilla war between black nationalists and the Rhodesian security forces. The couple farms the land, builds a home, gets married, has children, goes on vacation, all in the month of August. Their life takes place in these images. It all happened, yet never was. Distinguishing the work is the fact that R. and A. did get married, did build a structure, did farm the land. The work is documentary photography infused with fiction. The past is the present, which in turn is the future. An assemblage of objects and unfinished works from Terrence’s studio to be reinterpreted in space. Xavier made, lit and photographed the installation, later using the images to make durational graphite on paper drawings. Yapci Ramos continues her ongoing series of “points” connected throughout the world. 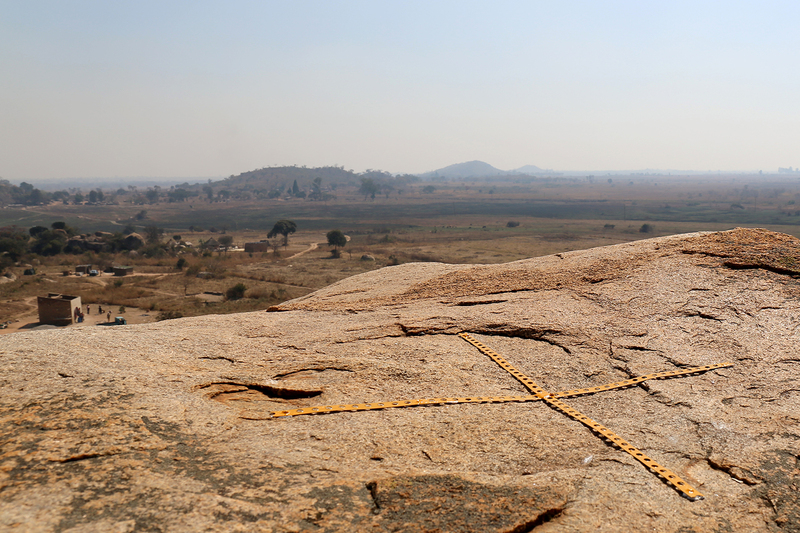 High on the sacred mount overlooking CTG Harare, she sets Point Zero, a metal “X” burrowed into the stone marking a place to look upon the structure and surrounding land. Before drilling into the stone, Ramos sought permission from the local shaman, Samaita, and the ancestral spirit he channels, Sukuru. Only after Sukuru gave specific instructions on how to make the work and how to climb the mount with the required spiritual respect, was Ramos allowed to permanently instal the sculpture. Steimer and Musekiwa wanted to address the building of the CTG Harare itself as they created this inaugural exhibition. The two works—one hung from the ceiling and in constant motion, while the second stands firmly on the ground—oscillate between a conversation with the physical and the divine. They are beacons of love, light and creativity, born out of gratitude and respect for the land, its inhabitants and ancestors. At the beginning of 2017, our Zimbabwean partner, Dzimbanhete Arts & Culture Interactions, received a notice of eviction from an oncoming commerical development. The CTG Collective joined forces with Dzimbanhete in its fight to save the art center, but after several unsuccessful attempts to stop the sale of the land, Dzimbanhete was evicted. While obtaining a new plot of land required complex negotiations with the Zimbabwean government, just before the summer, Dzimbanhete was granted the use of Plot 1 at Stonehurts farm. In what felt like a miraculous turn of events after a long battle, the land was slated as “Cultural Use,” effectively preventing any future developments from being able to capture the lot. Samaita, our local Shaman and a co-founder of Dzimbanhete, selected the spot where we would dig for water. After digging 15 meters and not finding water, the contractor called saying it would cost an extra sum to dig deeper. Samaita was confident he had selected the perfect location so Chiko, the other co-founder, gave the go ahead to keep digging. One meter later, Dzimbanhete hit water. 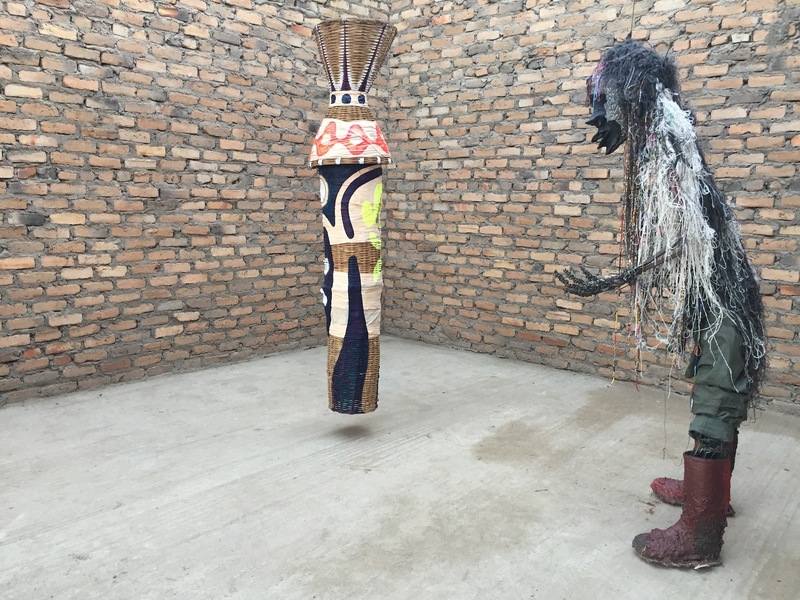 It is important to us to reach further down the Zimbabwean art scene and into the younger generation, some of whom are still in school, while others have just begun their professional art practices. This broadening of the Residency’s interactions serves to build connections for the future, and to share what we’ve learned, individually and as a Collective, over the past years. Young artists and art students were invited to attend two days of lectures and two days of artist presentations and portfolio reviews. Chikonzero Chazunguza (co-founder of Dzimbanhete) spoke on his experience of building and running an art center that has supported several generations of Zimbabwean artists in making the leap from student to Venice Biennale participants. Calvin Dondo (artist) spoke on his 4-decade long international career, as well as the successes and challenges he faced working in the West. 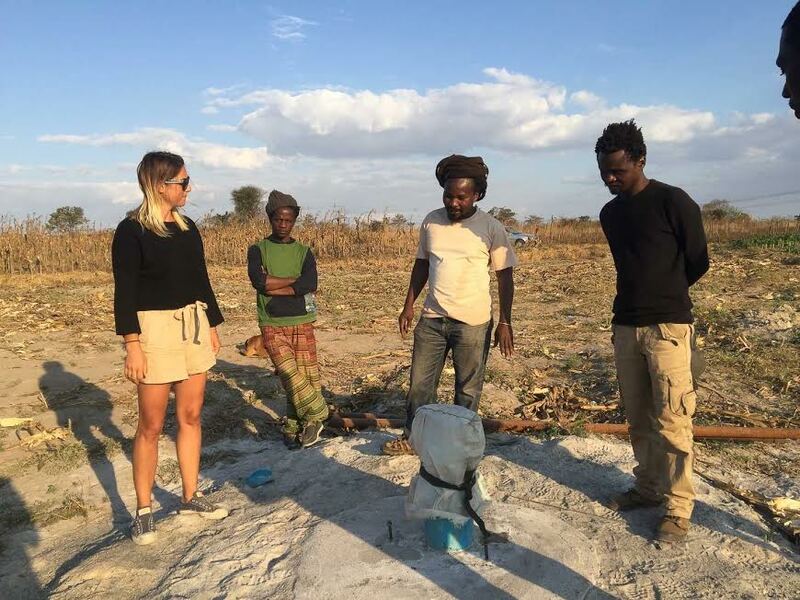 Catinca Tabacaru spoke about running a gallery in New York, building a gallery in Harare, and how she finds and works with the artists in her roster. 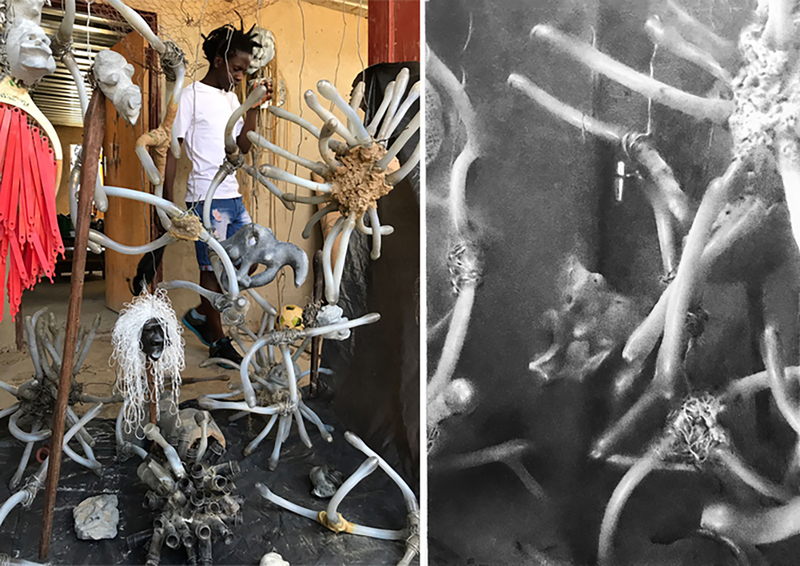 Residency artists and CTG Collective Members, Rachel Monosov, Justin Orvis Steimer, Admire Kamudzengerere, Terrence Musekiwa, Xavier Robles de Medina, and Yapci Ramos, offered lectures on their practices as well as their career journeys thus far. The workshop created a space for young artists to interact with practicing artists, to ask questions, and to explore how they might deepen their own practice, as well as better understand the international art world. Two additional days were spent where the young artists were given the opportunity to present their own work and receive feedback both from the lecturers as well as their peers. Attendees of the worksho were invited to submit applications on the first day for a mini internship with the CTG Collective. Three young artists were selected, each with different talents and interests, and shadowed the artists in residence for a week – assisting with projects and art making.